For many people, online binary options trading is often seen as a viable alternative to earning additional side income during their free time. While binary options trading is often touted as being easy and simple, It is in fact very risky especially for beginner traders. To help new traders overcome this hurdle, many platform developers have started to introduce the concept of social trading to binary options trading as well. Social trading allows beginner traders to observe how experienced traders trade and if they choose to, they can also emulate the trades of the more experienced traders in real time. This is what the newly introduced social trading platform SoXange aim to do for its users. The question is can the SoXange social platform live up to its expectations? Read our in-depth review of it to know more. 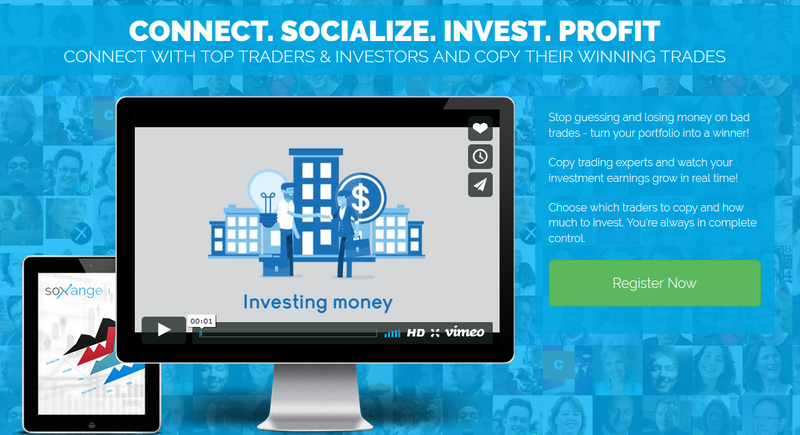 SoXange is a binary options social trading platform. It is one of the first few social trading platforms that is dedicated for binary options trading. The trading platform is specifically targeted towards beginner traders that lack any trading experiences in online trading. The platform is essentially a social network of binary options traders that let beginner traders follow the footsteps of their more experienced and successful peers. It also let beginner traders copy the trades of the traders that they are following. Simply by following those traders with a high winning ratio, beginner traders can also hope to do as well with their own trades. But the question is it really that simple? Our research shows that SoXange is sketchy on details as to the company behind the social trading platform. In addition, the platform doesn’t provide any verifiable statistics for the so-called successful traders. The FAQ’s that are found on the website also lacks depth in the information that it seeks to provide. Unlike the more established social trading platforms that are found in the forex trading industry, the SoXange’s website seems barebones lacking in information for prospective traders to study. As mentioned earlier, SoXange is basically a social network which links binary options traders together on a single platform. The platform has 2 main options to newcomers to choose from. They can either choose to be a trader or a guru. If you decided to become just a trader, your first course of action will be to check the listing of top ranking traders to see which traders that you want to follow. Beside the name of each trader, you will find several key statistics such as the number of followers, the risk ratio, the ranking of the trader on the list and percentage gain. From our observations, we noted that all of the top traders listed on the board have no details for their key stats which is highly suspicious. Without the key stats, it is virtually impossible to make any evaluations about the performance of the traders. However if we decided, despite the lack of statistical information, that we want to follow a particular trader, the next course of action will be to decide how you want to invest for each trade. Once you have done that, the trades which are executed by your “guru” trader will be duplicated for your trading account as well. Of course if you feel that you are good enough, you can always sign up to be a “guru” trader instead. By becoming a “guru” trader, you will also get to earn a commission from each of your followers. The concept of social trading though new for the binary options trading industry is not a new one in fact. For years, the spot forex trading industry has been adopting this trading concept and the leading forex social trading platforms are much better developed and come with a lot more features and information than what SoXange is able to provide. To us, the SoXange trading platform poses a huge trading risk since we have no idea who are the people behind the platform and who are the so called “guru”. Based on our research and experience, we can only advise our readers to avoid signing up with SoXange. Although the idea of social trading is sound, the implementation of this trading concept by SoXange seems problematic. Furthermore our research shows that the SoXange platform is an exact copy of 3 other social trading platforms called Copyactiv, Copinvest and Investocopy. All these 3 social trading platforms have already earned a reputation of a being scams. Our conclusion is SoXange is most likely another scam by the same people now operating under a different name. While there is no direct evidence to point to SoXange to be a scam platform, we like to remind our readers that the onus is on SoXange to provide adequate information about its services rather than for us to blindly trust them on faith. Binary Minery review: SoXange: 1 stars.